We’re all keen to see our taxes spent locally where they can deliver most benefit to our communities and have the greatest impact on them. National Government, Local Authorities and commissioning clients can all insist on local supply chain component – which is what we want. 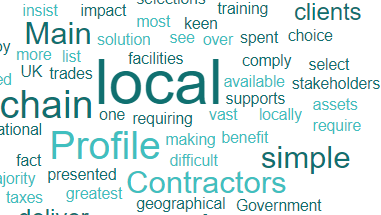 By requiring and utilising a local supply chain, stakeholders can deliver the: assets, facilities, employment, training and investment in local communities that we all want. And for the vast majority, the solution is simple – Builder’s Profile. In fact, it’s no more difficult for Builder’s Profile main contractors to identify and employ a local supply chain than it is for commissioning clients to ask for one. A Premium Member Profile is visible to over 70% of UK main contractors and supports local supply chain choice by making simple geographical selections available to them. Users select the trades they require, where they want them, and are then presented with a list of ‘local’ Builder’s Profile subcontractors who are qualified, compliant and contract ready. Simple.